T32106SDB - 1/32 Porsche 962 LM signed by Derek Bell [T32106SDB] - $179.95 : TSR Slot Cars, TSR Slot Cars - Dedicated to Slot Car racing, collecting, restoration, track design, electronics and software. 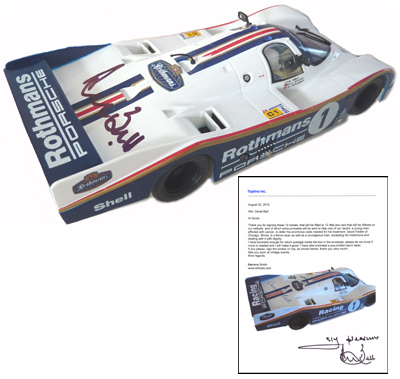 Derek Bell, co-winner of the 24 Hours at Le Mans with the full-size version of this car, kindly accepted to sign a few of these models, that are being offered to collectors. Part of the sale generates a donation to the Wounded Warriors project. Each car is numbered and supplied with a copy of our letter to Derek Bell and signed by him. The car is fitted with the updated TSR chassis. 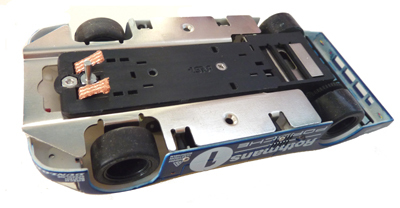 Our customers tell us that the TSR chassis offers the fastest, best handling performance of any home-racing car on the market. NOTE: this model is not to be sold to persons less than 21 years old.